Iowa State University researchers receive EPA grant to study harmful algal blooms in Iowa lakes. Harmful algal blooms, like the one on this Iowa lake, discolor surface water and pose health risk to humans and animals who are exposed to resulting toxins. Photo courtesy of Elizabeth Swanner. 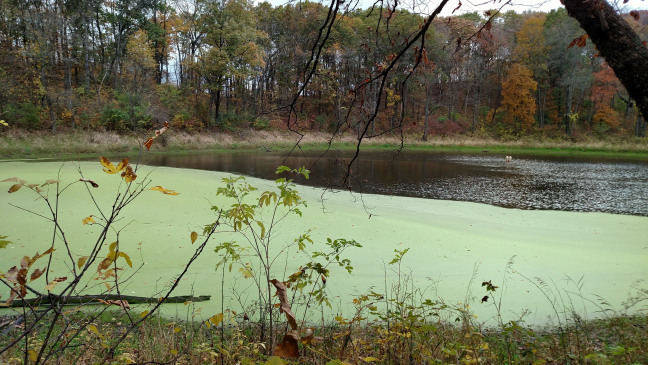 Dr. Elizabeth Swanner, along with researchers from the ISU College of Engineering, received a $760,000 grant from the U.S. Environmental Protection Agency to study harmful algal blooms, a growing threat to human and animal health in Iowa’s lakes. Harmful algal blooms in water produce dangerous toxins that can cause serious health concerns for humans, as well as pets, livestock and wildlife. Blue-green algae, known as cyanobacteria, are microscopic organisms that live in lakes and streams, usually in low numbers. But cyanobacteria, which have the ability to produce toxic byproducts, can grow quickly and form blooms that discolor the water. Blooms usually occur in warm, shallow surface water during the summer months in Iowa. The research team intends to develop new methods that make surveillance of harmful algal blooms more efficient and less costly. The full story can be read on LAS News.